Everybody knows this film. It's the classic zombie film that launched George A. Romero's career and also, allegedly, made him no money whatsoever because the original theatrical distributor neglected to place a copyright indication on the prints. 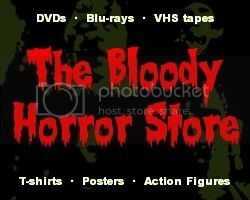 It has lapsed into the public domain and dozens of DVD companies have reproduced it so many times that it's pretty hard to find any "value horror" multi-DVD pack without it. Copies have even been given away free with newspapers in the UK. If you've never watched a zombie horror movie then this is really the only one you ever need to. Everything you want is here from a group of people trapped in a house fighting for survival to lurching flesh-eating zombies who seem to be unstoppable. The acting is way above what you normally expect from a horror movie even though a lot of the dialogue was improvised and many cast members had never acted in a movie before. There's lots of action, scares, gore and violence, plus a subtext of socio-political commentary which you can pretty much ignore should you be so inclined. I must admit that I never even noticed until it was pointed out to me either. There's really nothing bad to say about "Night of the Living Dead". I'm pretty sure everybody has at least ten copies of it already so I don't even need to recommend it. Just avoid the colourised versions (which I think lose a lot of atmosphere and look a bit weird) and the remake (although some people actually like that one too) and you can't go wrong. An amusing game to play when you are bored though is to go through your DVD collection and count how many copies of "Night of the Living Dead" you actually own. From the various multi-packs that I've bought, I actually have 14 copies including the colour one. Wikipedia says there are 19 DVD companies still reproducing it so just 5 more to go. How many have you got?